Becoming a chocolatier should be a long-term commitment and borne from a real desire and love of working with chocolate. It may seem like a niche line of work, but in fact it is a remarkably competitive industry. Therefore you will need to be determined and ready for set-backs on your journey to becoming a chocolatier. You can begin to learn more about the work itself by attending courses or classes in your region. Other character requirements are patience, as the hours are long. Obviously a key element will be your own creativity and skill in the world of chocolate making. Like other food and gastronomic industries, the ability to cope with pressure and think on your feet is a prerequisite. Coupled with having all these attributes, there is also the need to have great interpersonal skills. Ultimately, as a chocolatier, you will be working for and serving the public as your customers. Hopefully your talents will be in demand and therefore you will need to be in tune with marketing and advertising as a business. You can begin to learn more about the work itself by attending courses or classes in your region. This will gain you valuable experience, as well as help to familiarise you with the chocolate making industry. Feel free to ask the instructor questions, because you want to display a keen knowledge on the subject. There are culinary courses that you can attend at colleges up and down the country too. Check for details of the course to discover the specifics of what they do. If one suits your criteria, then this is a more formal way of learning the chocolatier trade. Obviously, factor costs in to all your options, as this could have a say on which you decide on. You could also request a visit to a chocolatier and see how they work in the flesh. This can be the perfect opportunity to gaining an insight into your chosen environment. 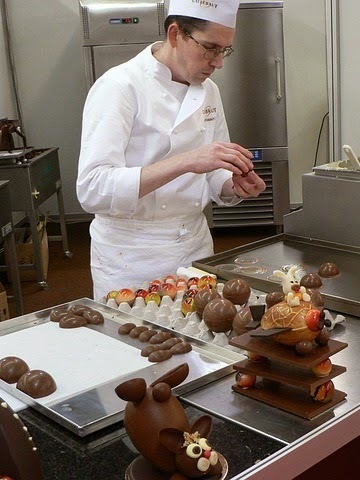 You could be fortunate enough to be able to work as an apprentice for a chocolatier, and be guided under their tuition. Whichever way you choose to begin, you must be aware of the hard work and graft needed to succeed in this industry. Whilst you are learning about making chocolates, you should start thinking of the bigger picture and your future as a chocolatier. What type of chocolates will you make? There are so many varieties in all kinds of shapes, sizes and flavours. Will you want to start your own business or work for an existing one? Will you look for a business partner or another chocolatier perhaps to join forces? As you can tell, becoming a chocolatier is challenging and competitive, but one that offers so many great rewards in return. If it is the path you choose to take, then jump into it with passion and a desire to succeed.